This weeks manicure is more of an adoration post than anything else really. When Deborah came back from her holiday in the States last year she brought me this awesome bottle of polish: Hot Topic - Beautiful Revenge. 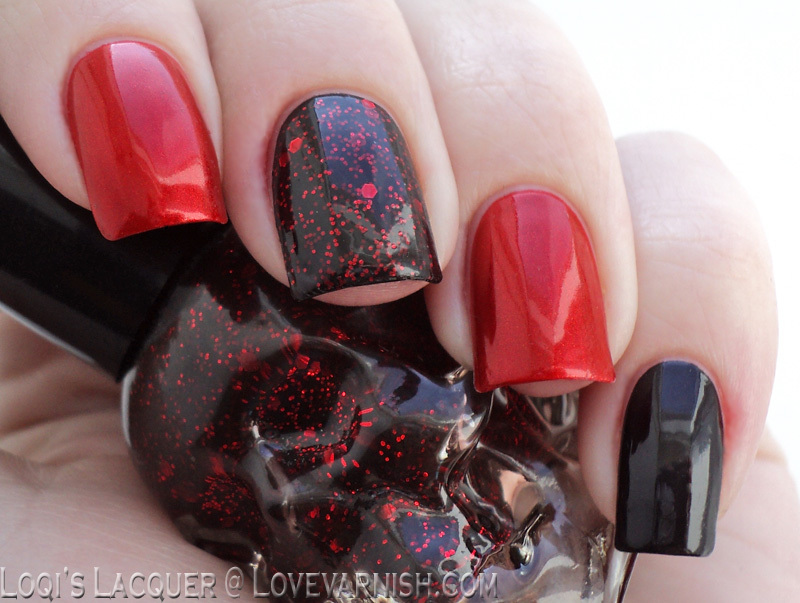 I have worn it before, and the polish itself is gorgeous, but that bottle....awe-some! I keep giggling whenever I look at it in my stash! It's just so weird and cute! 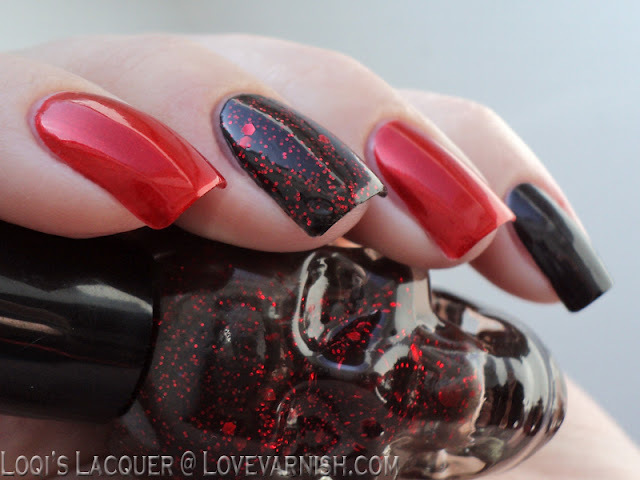 So I thought it was time for a skullbottle inspired manicure! 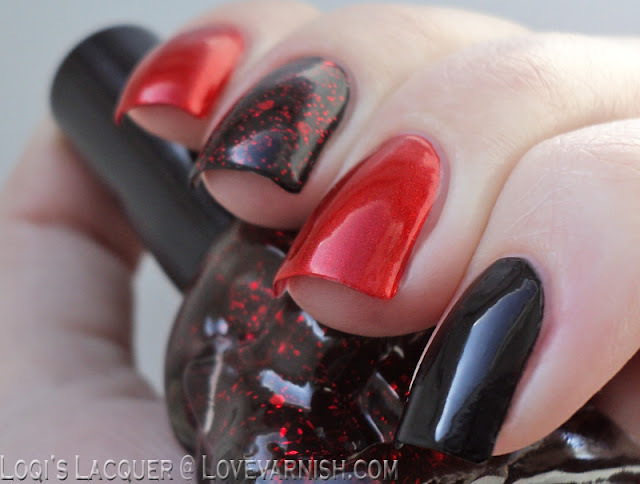 For this manicure I used Wet 'n Wild - Black Crème, OPI - Die Another Day and of course Beautiful Revenge (which, for those of you who were wondering, is a dupe for Deborah Lippmann - Ruby Red Slippers!). Nothing too complicated, but I really liked the result! Do you have any strange/funny/weird shaped bottles in your stash? Please let me know, I'd love to see them! 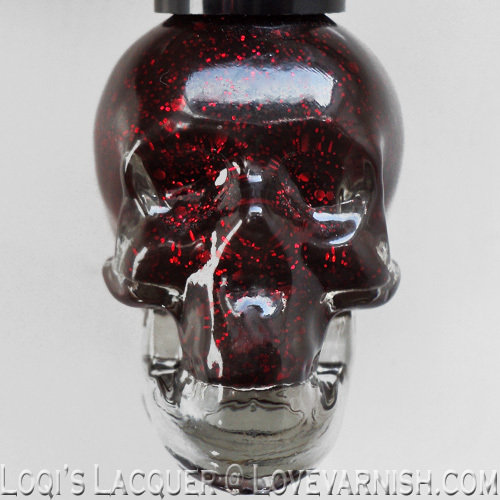 I am in love with red glitter at the moment, and just ordered myself a new one <3 This is awesome!! This is amazing and the bottle is so cool :) I once had a nail polish bottle who looked like a sitting cat, I don't know what happened to it. This color is great, wooow! Skull shaped nail polish??? Count me in! All the bottles in my collection are so normal lol. Interesting bottle and interesting shade, it reminds me of Deborah Lippman's razzle dazzle just the glitter colours is a little different. Thank you! Have fun with your new beauty! Those with the long golden bottlecap tails? I love how those look! I'd love a pumpkin bottle! Cute!